Are you all glad that flakies are being represented in nail polish this year? It's nice to see companies embracing the flakie. 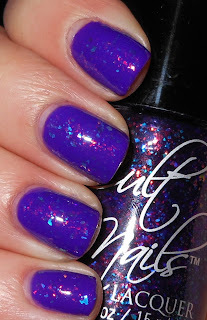 Cult Nails does a great job with the flakie.....Unicorn Puke/Clairvoyant...come on! That polish was insane. Maria always impresses me with her Cult Nails creations. I know many missed out on Unicorn Puke/Clairvoyant, but I think Seduction, though it's not a dupe is spectacular in its own right. 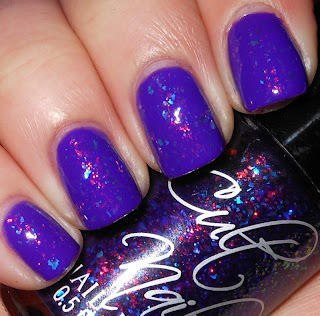 Seduction is a sheer jelly purple base with light blue and red iridescent flakies. Amazing! The depth these flakies make this absolutely stunning and multi-dimensional. I do think this is most definitely best layered. You could definitely wear it alone, but I think the magic of this polish comes alive over other colors. The main difference between this and Unicorn Puke/Clairvoyant is the absence of green flakies. I also think the base on Seduction is more red toned than the Unicorn Puke/Clairvoyant. Seduction is pretty amazing, it may not be Unicorn Puke, but it will surely impress! *This product was given to me for review by Cult Nails. I layered mine over a purple and I loved it!!!! It's such a beautiful flakie!!! Stunning combo and gorgeous pictures! :) I have Clairvoyant on today - we must have been on the same wavelength:) I love this! Very pretty! I should try this combo since I have both of these polishes! Gorgeous! I passed on Seduction just because I have the other CN flakies. Hello StardustStephanie, I now need this Cult polish thanks to you! I don't have any yet, but I admire Maria and her empire she is beginning there. I won thirty polishes from her in a giveaway once, and it was one of the most amazing things ever. I read your other blog and it made me smile, because I am only now finding my voice in my 40s. I congratulate you on finding yours at such a young age. I am glad you did, you should feel great that you found it and gained the confidence to speak up for your self. I know it is hard, but you are doing so amazingly well. I am happy that you won't spend any more time keeping your light under a barrel.